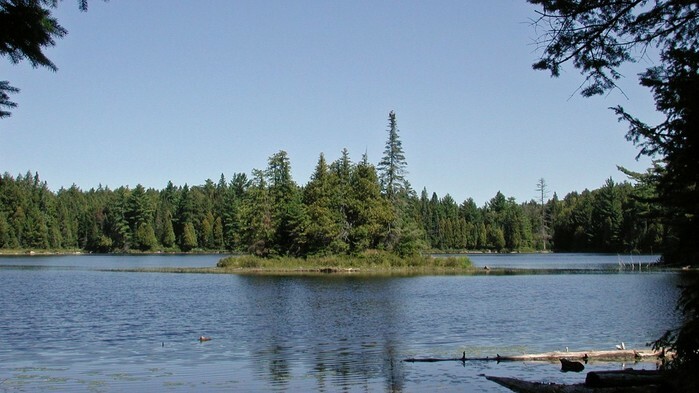 One of the highlights of my trips to Algonquin is a visit to Ouse lake, a very small, shallow, and to most people an insignificant lake in Algonquin. I was introduced to the lake while taking my first canoe trip from Camp Pathfinder as a camper. Our trip was a short one starting from Source Lake and running up part of "Main Street" then returning to Source. Ouse lake was at the end of our first portage. In later years, I have thought of it as the beginning of my exploration of Algonquin. As I sit on various parts of the shoreline, watching the lake and surrounding forest, I relish the peace, quiet and natural beauty that pervades the atmosphere. The sounds from the highway are either muted or absent depending upon the volume of traffic and the noises from the wind. Songs of white-throated sparrows, chickadees, and other birds are frequent. Frogs, turtles, dragonflies, water spiders, and insects are always present. Occasionally there is a loon, merganser, or great blue heron fishing in the lake. There are signs of moose and bear around, but the animals themselves are rarely seen. Chipmunks and squirrels are common and on rare occasions I have seen beaver, martin and other wildlife. Often, after visiting Ouse Lake, I walk down Wellwood Road, a long ago abandoned dirt path that leads to the old roadbed of the former Ottawa, Arnprior and Parry Sound Railway. (The OA&PS was acquired by a host of subsequent railroads, including the Grand Trunk Railway and the Canadian National Railway.) The last service to the park was in 1959. The rails and many of the ties were pulled up and recycled, but the roadbed itself forms a wonderful place from which to enjoy the park. Relaxing at the lake and being in Algonquin Park gives me a chance for quiet contemplation. It gives me a chance to regain my perspective on what is going on in my life. I find that it greatly refreshes me and that after a visit, I am much more ready to face the trials and tribulations of the "real" world. So when it came time to pick a website name, it somehow seemed only right to select Ouse.com.